I loudly and proudly admit that I am the biggest fan of Clover Wonder Clips! They are truly wonderful. It’s funny how a simple invention can change an industry. Clips have been around a long time, but marketing them to quilters and sewists as a way to hold fabric together was pure genius. Before clips were used to hold fabric together, the straight pin was one of the most common sewing notions. I looked into the history of pins and wanted to share a few details. Some of the first pins where thought to be used in ancient Roman times1. They were known in Latin as fibula and mirrored what is known today as the modern safety pin. These pins were made of a variety of materials and some were adorned with jewels, other precious gems and metals. This exuded pride, wealth and rich traditions for families. Straight pins were used in the 18th century to fasten clothes, as well as for sewing2. Pins came in all sizes for the variety of purposes they served, and pins were often made from metal, bone or wood3. The process was arduous, which meant they were often only accessible to the wealthy. Inventors continued to refine the process, making it easier, faster and cheaper to produce pins. Today, you can still find pins that come in a variety of lengths, materials and thicknesses. One of the challenges of using pins while sewing is that it pierces the fabric, which one could argue compromises the integrity of the fabric. This is especially true for very delicate fabrics like silk. Sometimes it’s easy to forget to pull out a pin in time before a sewing machine needle makes contact with it. Metal against metal usually results in a timeout for replacing the machine needle and the straight pin. Sewing and quilting requires the use of many sharp objects - the machine needle, rotary cutter and scissors. Clips offer a small reprieve from cutting yourself. Clover Wonder Clips were designed for the specific use of holding fabric together. They don’t cause pin holes, they hold together all kinds of fabric and they don’t cause finger pricks. The clips also have seam allowance markings! The bottom of the clip is flat so that it runs smoothly across your machine. Here are a few ways to use Clover Wonder Clips for your next project. 1. Use in place of straight pins to hold fabric together while sewing. 2. Hold binding in place for hand-binding a quilt. 3. 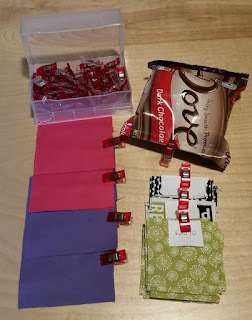 Organize piles of fabric you’ve cut for a pattern and clip each group together. 4. After you’ve folded fabric to put back on your shelf, use a clip to keep it together. 5. Clip your hair back so it’s out of your eyes while working on an intricate task. How else do you use Clover Wonder Clips? *No one asked me or paid me to write about Clover Wonder Clips. I love to share good tools and resources I find and share my own opinions about them. In my patterns, I offer some personalization suggestions. I want you to feel inspired to make something a little different than what I produced. Maybe it's a different fabric. Maybe it's a tweak to the layout. Maybe it's more or less color options than my original design. I want you to make it your own! I wanted to offer some additional personalization ideas for those who have purchased (thank you so much!) the #InTheRightDirectionQuilt pattern. 1) Make one or more arrows with an ombre affect. I’d love to see the base of the arrow start with a light fabric and darken by the time it reaches the tip. Or reversed! Again, you could apply this to all arrows or just a few. I think arrow 5 or 9 from the pattern would be really neat with this affect. We’ve all been there. We have a little free time to sew, so we make our way to our sewing room/corner/nook and we just stare. We start feeling annoyed at ourselves for having too much fabric or too many UFOs or too many less-than-perfect seams and we walk away in a funk. Our sewjo is gone and we don’t know what to do to get it back. Here are a few tips I use to level-set my expectations and get my machine humming again.